The title may be influent, but the comedy is not. Nor is the narrative. Rewind to Chitchor, Rajnigandha, Khatta Meetha, Baaton baton meinand the other staples of the '70s, presenting a smorgasbord of middle class miens, sound comedy and melodious music. Main, Meri Biwi aur Woh revives that genre. Direction worthwhile, displaying small town middle class India in all its glory ' warts and all. And to compensate for the lack of music which was the USP of the earlier gems of middle classdom, there is a hero with extraordinary dimensions and gestures. Every idiosyncrasy of the middle class is lovingly detailed ' the match box university residences, the handkerchief patch garden, the decrepit terrace transformed by candlelit for a pound party, the official quarter re-peopled by dowry donations, the ancestral home with brick floor courtyard, the routine lives and the matchmaking fundas. Truly a story of ordinary people, people living ordinary lives, most humanly. 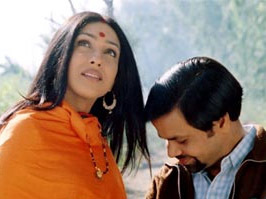 Everything about it is MIDDLE CLASS in capitals, everything except the heavy make up of the heroine, which, however, does not detract from Rituparna's performance, which matches strides with impeccable performances for Rajpal Jadav, K K Menon and the old timers from TV led by Bishararam of Humlog, on a silver screen outing.